We believe in a healing continuum for Indigenous communities from generations of disruptive policies and practices. MVISS stands with our healthy, thriving, urban Indigenous community inherently connected to our ancestral visions, grounded in diverse cultural knowledge & practices living in harmonious balance to celebrate each other’s gifts. 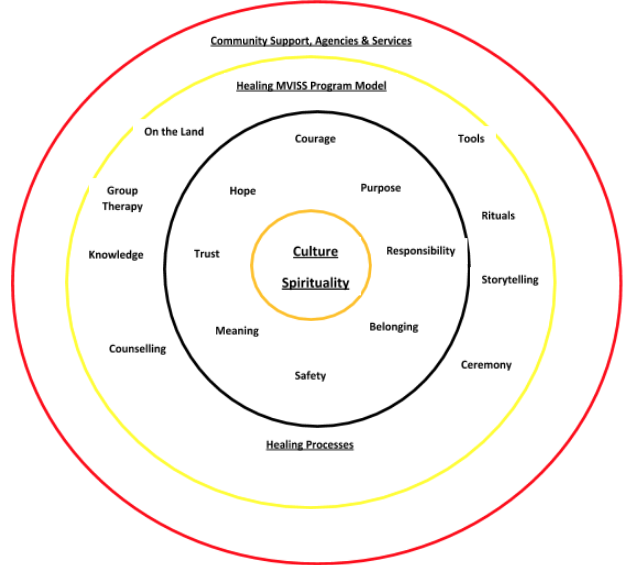 MVISS provides culturally diverse support services creating a safe & caring environment for people to connect with self and community by healing their trauma to achieve physical, mental, emotional & spiritual wellbeing grounded in Indigenous wisdom and resilience. To provide any other services or support ancillary to the purposes of the Society. We base our services on both culturally-based and trauma-informed practices. Indigenous people into mental wellness challenges and substance misuse. We believe there is nothing wrong with Indigenous cultures that needs to be changed. Apply what we refer to as Indigience (a mix between Indigenous Knowledge and program science) to ensure we back up our approaches with a solid evidence-base. Group Healing Facilitation aimed at underlying root causes will be the heart of our program. Linkages and referrals support to detox, daytox, residential treatment, BC Mood Disorder clinic, etc. Group work on areas such as: sexual abuse; grief and loss; historic trauma; residential school impacts, psychodramatic bodywork, etc. Outreach, community development and capacity building, including to the North Shore and Richmond. Safe space for community healing activities, such as 12-step groups, etc. A cultural strengths-based approach based on Indigience, Relational Care, Indigenous Human Development and using the Native Wellness Assessment@ developed by the Thunderbird Partnership Foundation. Elders, Cultural Workers and other Knowledge Keepers. Youth-targeted services within a life-span approach and wraparound structure. Indigenous cultural-competency training for non-Indigenous staff who serve Indigenous people. Partnership agreements with related agencies to enhance and expand service delivery. Our work takes place on the traditional, unceded territories of the Coast Salish peoples, including the territories of the xʷməθkwəy̓əm (Musqueam), Skwxwú7mesh (Squamish), Stó:lō and Səl̓ílwətaʔ/Selilwitulh (Tsleil-Waututh) Nations.